View basket “Watering System Check” has been added to your basket. 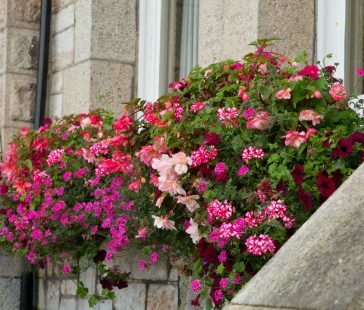 Window boxes are ‘works of art’! This year’s summer colours are purples, oranges, white with splashes of yellow and red. You are welcome to choose your own selection of colours at the checkout. 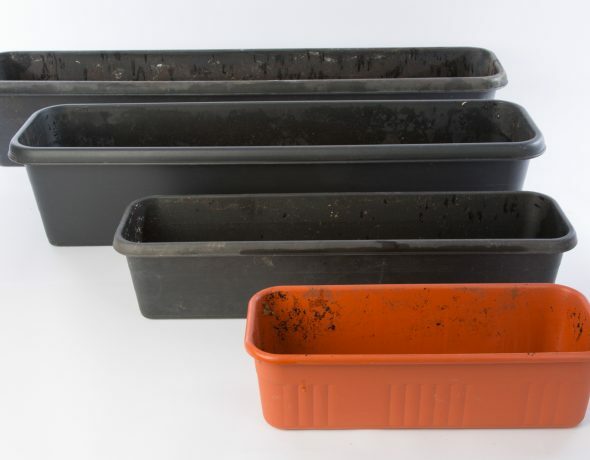 Our , off the shelf, window boxes come in a selection of sizes, from 15 inches to 40inches in length. 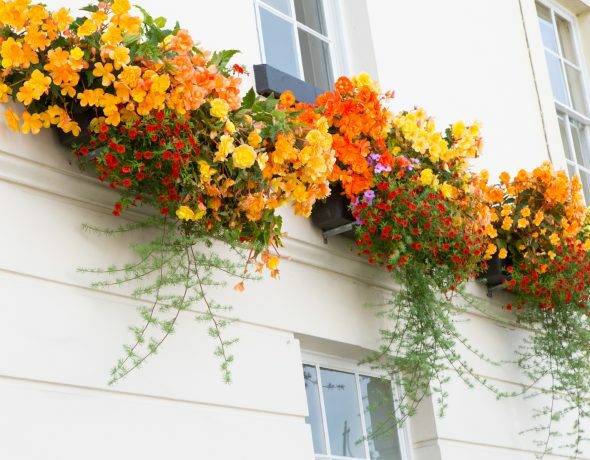 It will depend on your building and brackets, fewer but larger window boxes usually have more impact. 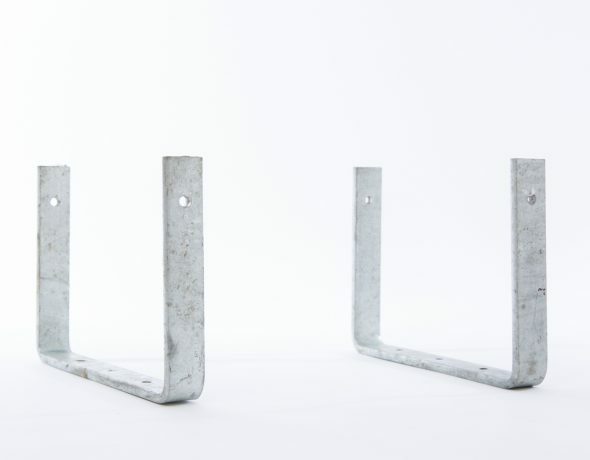 We have assorted brackets for fixing in different situation. 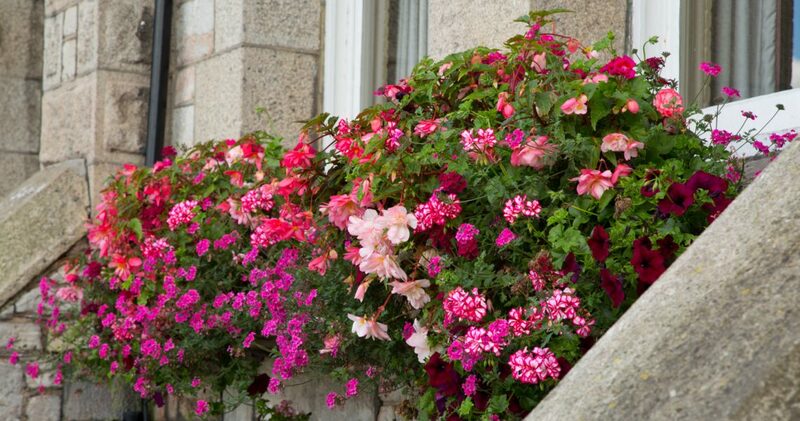 We recommend window boxes are fitted on the wall below the window sill. See our handy size guide below for more infomation. 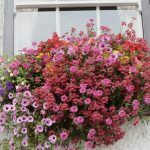 Amazing window boxes (troughs) all year round! These high quality designs come filled with the summer colours for this year. The colours are bright purples, oranges, white with splashes of red and yellow. 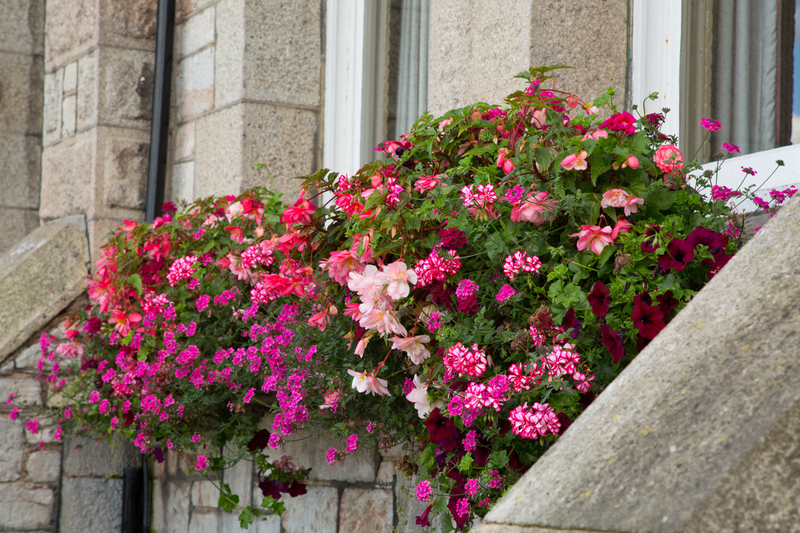 Our window boxes come in a selection of other sizes, from 15″x6″ inches to 40″x8″inches. We often insert these boxes into yours. Occasionally we make wood boxes which can be to any size. The price filled, delivered etc is about 1″x8″=£1.50 but you’d need to phone with your measurements! 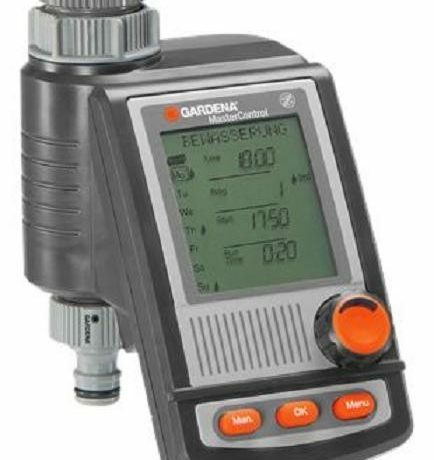 Please note that we have a minimum order of £120.00 on all purchases from our online shop. 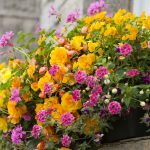 Caring for your display – all your plants need is watering every day, their feed is already added to the compost and varieties are chosen for perpetual flowering. If you have an existing water system would you like us to check it over and repair anything necessary, this guarantees your plants. If you would like a new water system installed that is fitted to an existing tap which can be inside or outside) for you to turn on/off each day. Would you like a timer/tap fitted (ideally inside) to a new or existing system so that it turns on/off each day automatically we set these times for 15 minutes on at 6.00am and 15 minutes on at midnight. 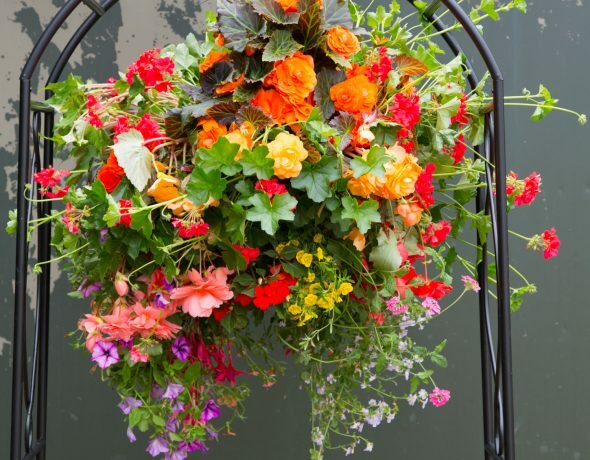 Hanging Baskets are ‘works of art’! 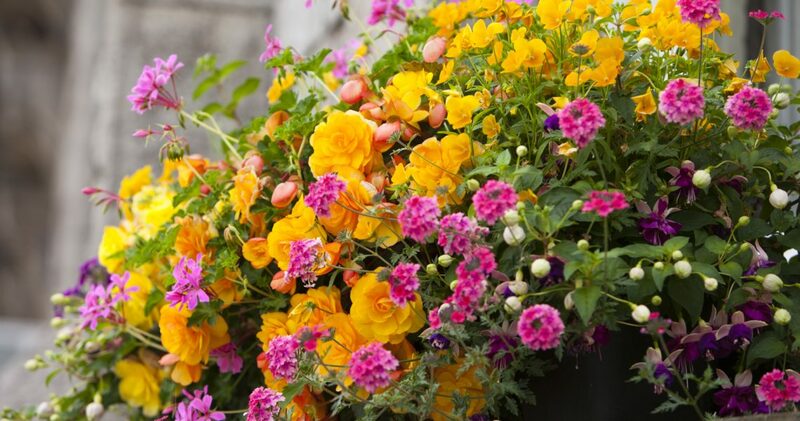 This year’s summer colours are purples, oranges, white with splashes of yellow and red. You are welcome to choose your own selection of colours at the checkout. 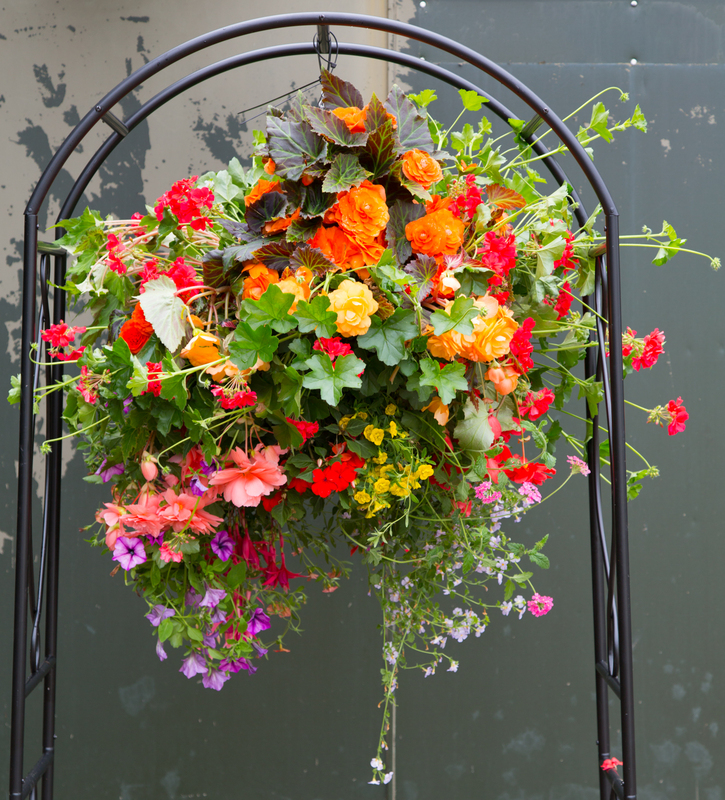 Our Hanging Baskets come in a selection of sizes, from 12 inches to 24inches in diammetre. It will depend on your building and brackets, fewer but larger baskets usually has more impact. 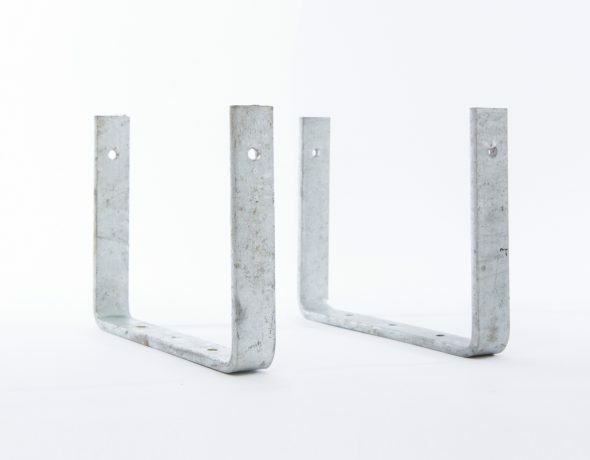 These galvanised brackets are supplied with optional fitting by our installers. 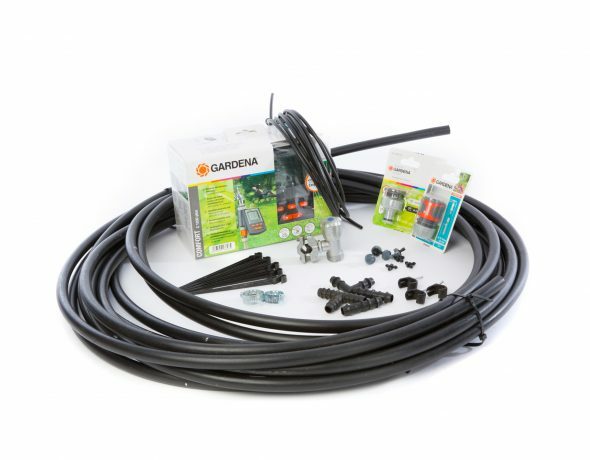 A fitted GARDENA Water Computer MasterControl is attached to the tap and controls the automatic irrigation of your premises, ensuring to keep your flowers looking great. Water systems are the key to great baskets. Watering systems save a lot of time and effort. We find a water source as near to the display as possible, install a tap and from that link pipework around a building with 16mm black plastic pipe. Remember to turn the system on and off twice each day. 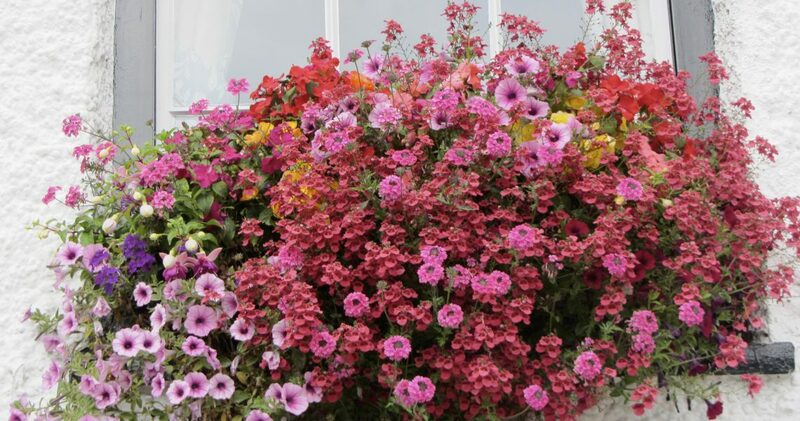 The plants not only grow, but absolutely flourish for months on end! If turning the tap on and off manually is inconvenient, we recommend having a water timer fitted, please order separately. To ensure your systems is maintained and working we need to check it over as we take one lot of flowers down and put another lot up, bits inevitably come apart and get lost. 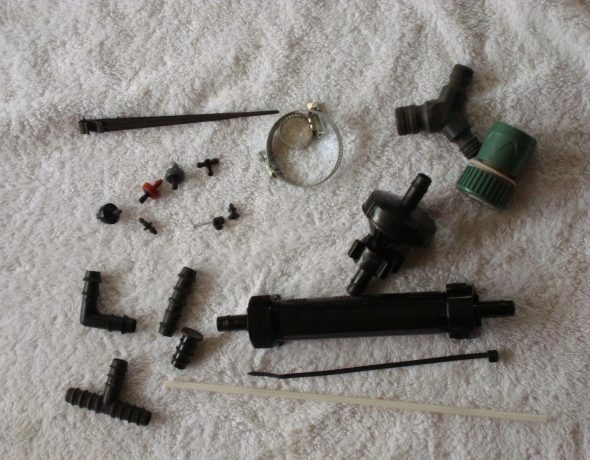 We replace these and any leaks so you can rest assured, your display, will get watered. 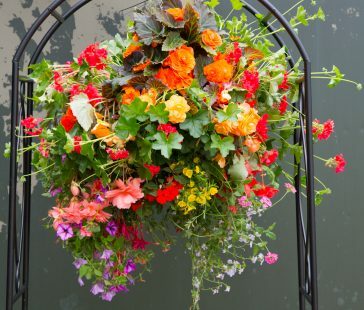 The hanging baskets have been stunning. They did arrive looking very battered but have picked up beautifully. I cannot praise Alison and her team highly enough. Two very pleasant gentlemen arrived, attached fixings to the frontage of the pub and hung my resplendent baskets. Another phone call at the end of summer and the baskets were exchanged for winter baskets. Top marks all round for a friendly and professional service at a more than reasonable cost. I can’t get over how beautiful mine are! For winter I’d like my 4 again, 4 for my neighbour and 1 for my daughter! I just wanted to tell you that the baskets are absolutely the best we have ever had. I might even get some winter baskets from you. 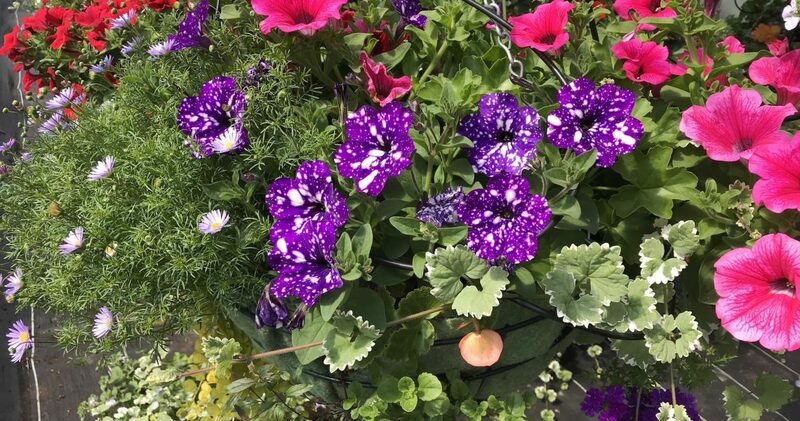 Absolutely Brilliant, Definitely worth getting as you don’t have to do a thing (which is perfect) everything is watered automatically and the baskets are changed throughout the year to correspond with the season. 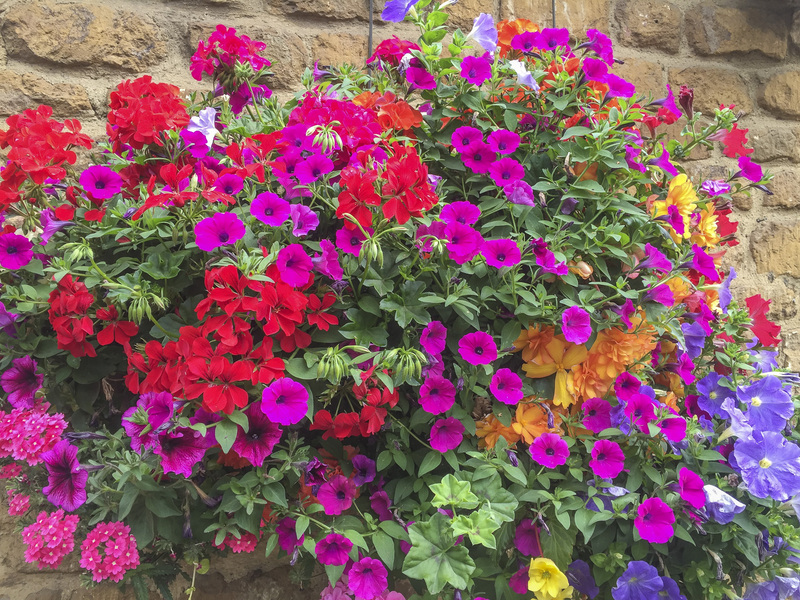 Here’s a scattering of Blooming Baskets customers, see one near you. 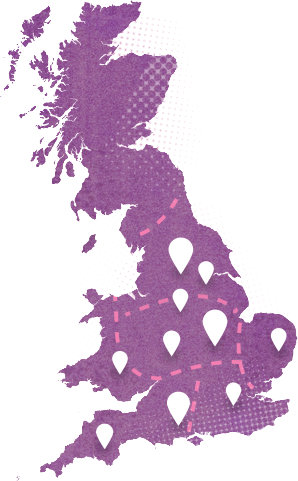 We deliver across the UK, mainly with our own lorries and vans, sometimes by post! For more information about how we deal with your data, click here.